There are a couple of often-used axioms when it comes to speeding up our draw stroke and shooting: “Slow is smooth, smooth is fast” and “reduce motion to increase speed,” also known as “Conservation of Motion.” Both concepts are valid. It certainly makes sense that the fewer number of movements that you make and the less distance that you cover, the faster your action will be. The traditional draw stroke has the shooter extending the gun, then lifting it to the target. Simply stated, under stress, our ability to think, analyze, and make decisions is slowed and reduced. Everyone reacts differently under stress. The number of effects that people experience will vary, as will their severity. The good news is that the more we train under stress, the less severe our ‘body alarm reaction’ will be. However, few us will ever have the opportunity to train under any conditions nearing the amount of stress we will experience with a real-life threat. What that means to us in practical terms is that we need to consider the likely physiological effects when developing defensive techniques and by extension, train accordingly. The right angle draw stroke keeps the gun facing the target while being lifted to the chest and then extending forward. Practice all of our gun handling skills: drawing, obtaining sight picture, trigger control, reloading, etc., to the point that we have obtained ‘Subconscious Competence.’ Also commonly known as muscle memory, it means that the actions are so well known to us that no thought is needed to accomplish them. This simply means, practice. Practice until you don’t need to think about the motions. Replace multiple techniques with a single technique that works in all situations so there is no need to waste valuable brainpower making a decision on which technique is appropriate for the situation at hand. The first on the agenda to modify is the draw stroke itself. 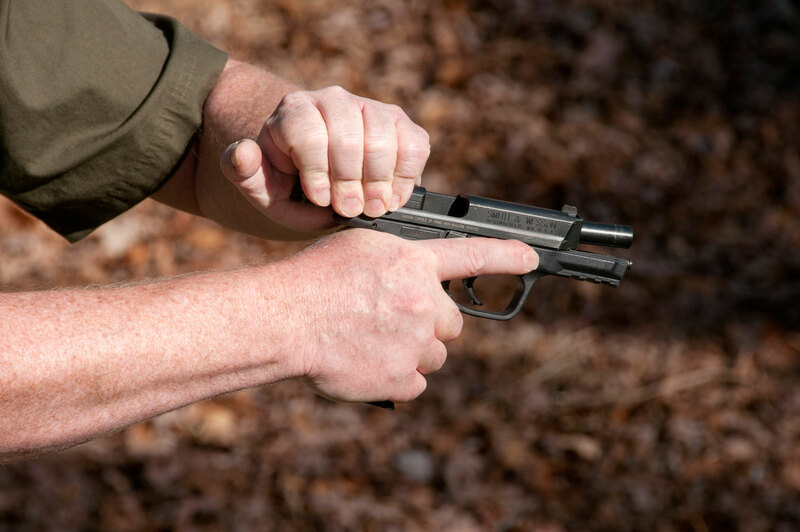 Many shooters use a typical draw stroke where the gun swings upward from the holster and the support hand meets the gun hand near full extension. Knowing that this does not work well when close to an object such as a desk or table (the gun will hit the object before being the target presentation) the close quarters draw stroke, also known as the right-angle draw stroke, is used when in a restricted space. Having the two draw-stroke options does work. However, every time a draw is made, the shooter has to spend the time and brainpower to decide which draw stroke to use. 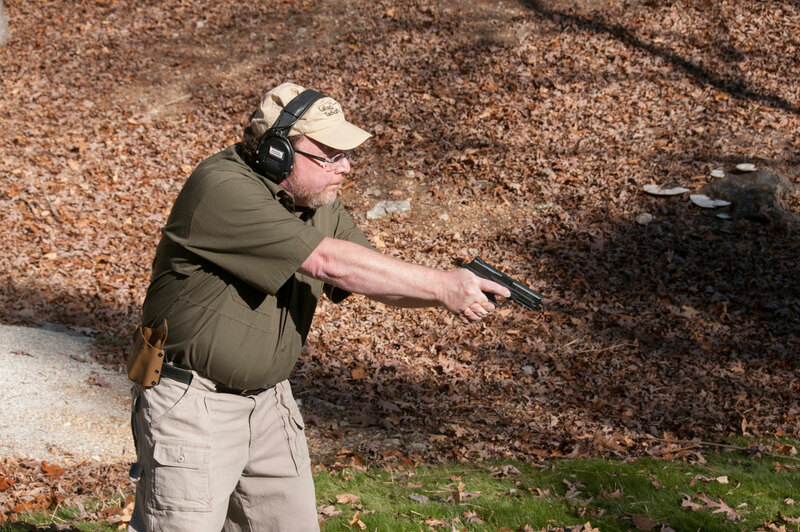 This seems simple and effortless while on the practice range, but could be more difficult and critical in a gunfight. The author uses the tap and rack every time that is pistol manipulated: loading, reloading, clearing jams and unloading. Using the one technique for all actions speeds the process by eliminating the need to decide which method to use. Every decision takes time and reduces our ability to concentrate on other, more important things, such as the attacker. Also, under stress, with reduced cognitive ability, the decision may not be as simple as it seems. Even if it’s only a split second lost, the time you spend making that decision could be the difference between winning and losing the fight. The solution is easy; stop thinking by eliminating the decision-making process altogether. Have only one draw stroke. The right-angle draw stroke is effective when you are in close confines, but also works perfectly well for when space is not limited. Use the right-angle draw stroke exclusively and don’t spend another precious split-second deciding which draw stroke is appropriate. Another step where multiple techniques can be reduced to a single one, is releasing the slide from slide lock. Options are to press down on the slide lock or rack the slide. The problem with using both techniques is that I often see shooters vacillate between the two techniques, wasting valuable time and precious brainpower. 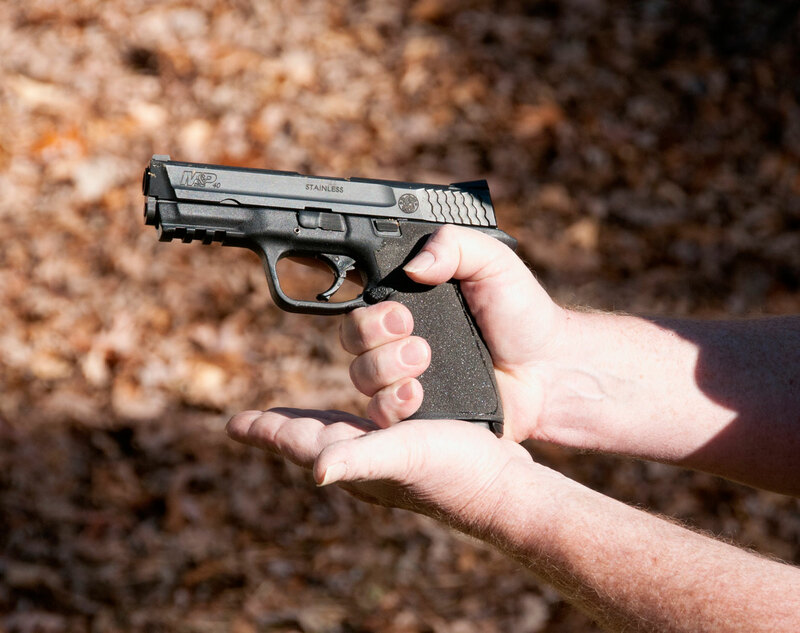 Using the slide lock only works when the slide is locked back, but grasping the slide can charge the gun regardless of the slide position. The requirement of deciding which technique to use can be eliminated by always using the one that works in all cases—grabbing the slide. It is the same concept when it comes to other aspects of gun handling. Every action that I perform with my handgun is a tap and rack. I tap and rack when I load my handgun. I tap and rack when I reload my handgun. I tap and rack when I empty my handgun and tap and rack when clearing jams. 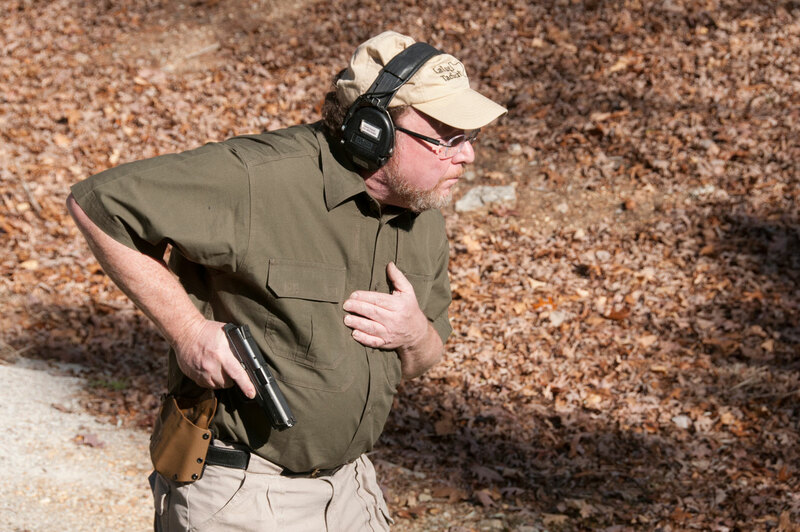 For me, every time that I need to do something with my handgun, I eliminate the requirement to think whether I need to tap and rack or just rack the slide by performing the same action in all instances. Rather than using the slide stop to release the slide, use the gross motion of grasping the slide on its top and pull rearward. When it comes to jams, keep in mind that a tap and rack will not clear all jams, but it will clear all jams that can be fixed during a gunfight. It will not fix a double feed, however. A double feed is a multi-step process and takes too long to perform in a gunfight. When it comes to clearing jams, my rule is that if it is not fixed with a single tap and rack, transition to a back-up weapon or get out of Dodge. When it comes to reloading, I perform the same tap and rack technique whether the chamber is loaded or the gun is at slide lock. I don’t stop to think whether the gun simply needs the slide released or to be fully racked. I eliminate the thought process altogether by tap and racking on every reload. As discussed, by eliminating the need to make a decision regarding which way to reload the handgun, I have sped up the process and maintained my concentration on the threat. If a reload is needed during a gunfight, the most important thing in the world is to get that gun reloaded—fast. Any process that speeds up the reload is of value. Video simulators, such as this FATS system are a great training tool by inducing stress when replicating real-life situations. You may be thinking that the time it takes to decide how to draw or cycle the action is so short that this concept is meaningless. This is true on the practice range, yet when under extreme stress, especially for those shooters who rarely, or never, have the to ability to train under stress, making even a small decision under stress can be quite taxing. One of the best ways to experience this phenomenon is by training with a video simulator or through force-on-force training. When I first started using a video simulator, I noticed my attention focused greatly on the threat and a distinct reduction in my ability to reason. I also realized, that the more I trained under the stress with the videos, the less it effected me. However, as the stress ratcheted upward, the effects of stress reemerged. This demonstrates that the ability to think is diminished under stress and that continued training under stress reduces its effects. As you shoot in various practice situations, pay attention to the specific techniques that you use. To determine whether you can reduce your need to make decisions, test thoroughly to see if any single technique can replace multiple ones, ensure it will work in all situations, and that you can perform it well while under stress. Testing your techniques and gun handling skills under stress is not difficult. Increase your speed, add movement while you shoot, shoot under the pressure of a timer, shoot a practice drill with other shooters in a competition, have a shooting partner give you rapid commands, have a partner yell at you to increase stress, or shoot with an interactive simulator or take advantage force-on-force training. While none of these will impose the high level of stress that will be induced in a lethal encounter, these are useful to test yourself and your techniques in conditions other routine range practice. Do you have tip a tip to faster and more accurately? Share it in the comment section. Fleeing Felon: Can You Shoot?